Happy Wednesday! I’m thinking positive in that we’re almost to Friday. It’s been the longest week and it’s only Wednesday, I think that’s normal though for trying to get back to reality after vacation. So you may have seem a sneak peak of these Salted Peanut Chocolate Cluster Nana Cream Bars yesterday on Instagram as I was photographing them to share with you next week. As I said it’s been a rough week and last night I went to get the post together for some espresso balls I was going to share and the whole post is missing. Both girls had soccer and I was at S’s practice when I realized it and couldn’t just re-write it because I didn’t have the recipe either as it was one I handwrote. So it was either try to pull something else together or wait until I got home and find it and stay up late to get it finished. Not being able to share the other recipe I’m posting this week, which also happens to be a frozen treat, until Friday and not being able to get to my network storage for some reason we’re going with plan B. Oh how I wish I could go with plan C but the girls ate ALL of those before I could get them photographed yesterday, yes they’re that good. 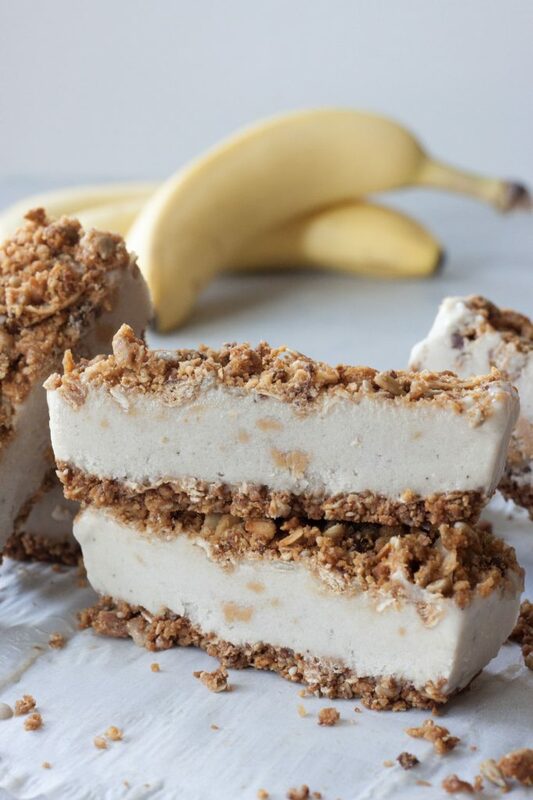 These Salted Peanut Chocolate Cluster Nana Cream Bars were on the list since last month when I shared my No Bake Blueberry Cheesecake Crumble Bars. 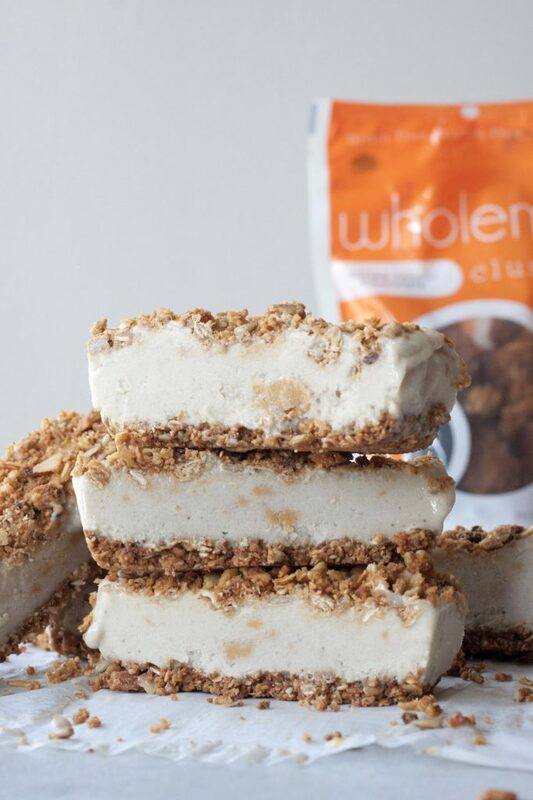 I wanted to play with my other fav Salted Peanut Chocolate Clusters but instead of making a cheesecake decided to make a quick and easy healthy frozen treat for summer. 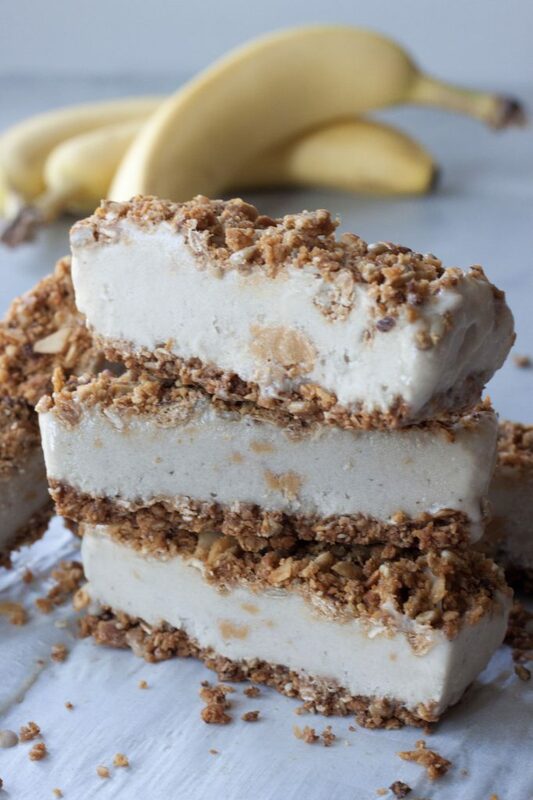 I’ve made nana cream bars in the past and you can sub and use the same granola crust recipe from that recipe as an option. I’ve tweaked it since then finding the best consistency using full fat coconut milk vs a dairy free milk beverage. Using the Salted Peanut Chocolate Whole Me Clusters makes it simple and easy and you only need 3 ingredients, 4 if you decide to swirl in peanut butter, and they’re ready in less than an hour if using the quick method of 2 frozen bananas and 2 fresh bananas. 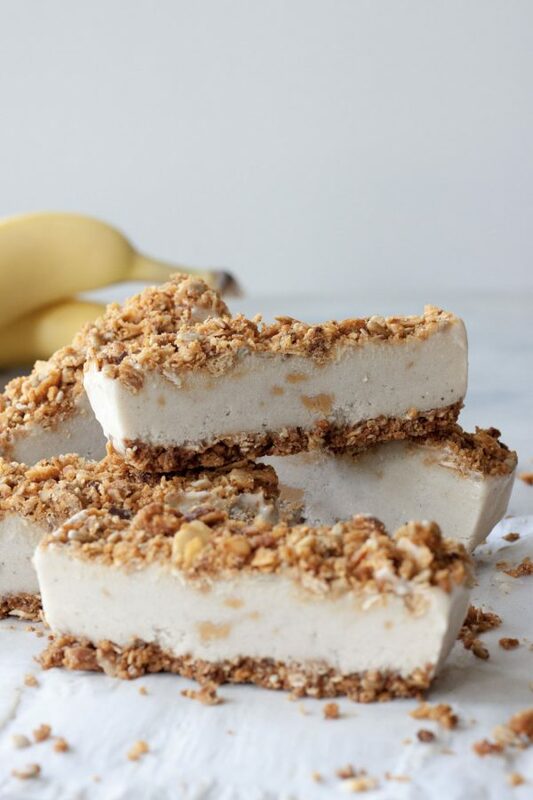 While you could use all frozen bananas you would have to add more coconut milk and I find the recipe is much creamier this way than using all frozen bananas and a milk beverage. If you follow me on Instagram you know that I’m a big fan of Whole Me and especially their Lemon Berry Chia Clusters and I have been for some time. A couple weeks ago I decided to become a Whole Me Ambassador sharing my love with even more people locally at events throughout the year. I already share them with family and friends, at barre, and even randomly since I usually have the single bags stashed in my purse so why not. This is not a sponsored post but just wanted to share as I’m excited as it’s a local company I love, run by two amazing and inspiring women, and this is the first post since becoming an ambassador. As I said if you don’t have access to the clusters or are looking to tweak them with something you have or to be nut free or paleo you can use the crust option in the notes or tweak if you have something else you think would work like crumbling an energy ball recipe for the top and pressing it into the bottom. 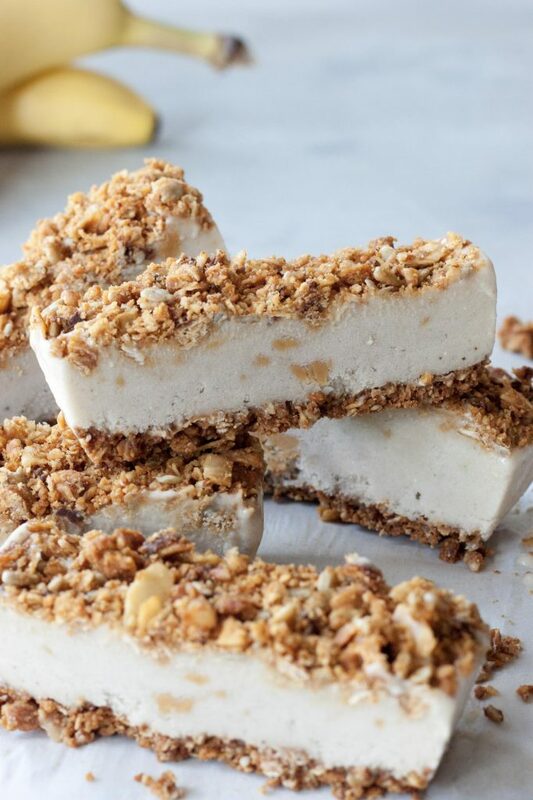 The next time you decide to have some friends over for a pool party or need a quick and healthy afternoon treat because you were running around all day in this hot humid weather whip these Salted Peanut Chocolate Cluster Nana Cram Bars up in less than 15 minutes and you could be eating them in no time! Quick and easy these Salted Peanut Chocolate Cluster Nana Cream Bars are the perfect summer treat. They're gluten free, grain free, and dairy free. Vegan and paleo friendly using alternate crust (clusters contain honey and peanuts). In a small food processor pulse half to two thirds of the bag of clusters, about 4-6 ounces, until you have a pretty small crumble texture. 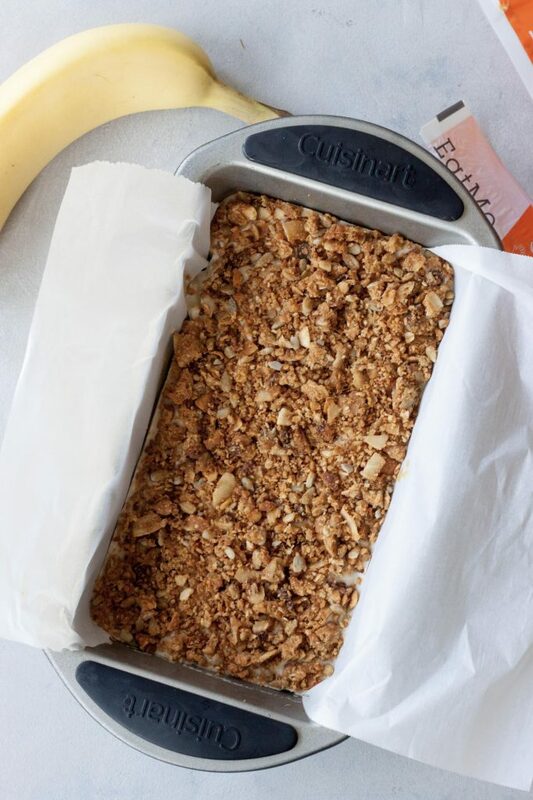 Line the bottom of a standard 9x5 loaf pan with a sheet of parchment paper and press the mixture evenly into the bottom of the pan. Set the pan in the freezer while you make the filling. While you don't need to do this I find that it helps me make sure I have a flat surface in the freezer before putting the finished bars in there and I'm already digging my frozen bananas out anyways. n a Vitamix, or high-speed blender, blend together your bananas and coconut milk. Remove the crust from the freezer and spread your banana mixture evenly on the crust. If you want to add peanut butter drizzle it over top of the nana cream and run a knife through to swirl it in. Crumble up the remaining clusters and sprinkle over the top. Gently press the cluster crumbles down just a little. Place pan back in the freezer to set for about an hour, or until set, if using fresh bananas it will take a few hours to set. Remove and cut bars with a sharp knife. Enjoy! If you'd like to sub for the clusters you can adapt the crust from this recipe or this one using granola. If using frozen bananas it works best to have them broken into smaller pieces. If using all frozen bananas you will need to do this and use a tamper tool and may need to add additional milk. ok I am going to need to find those chocolate peanut butter clusters asap! Oh man, I’m drooling. I want one of these right now SO bad. Yum! My mouth is watering right now! Loved the recipe!